This one is hard to place in a category. Much of the album fits into metal, but other music here is prog, and some of it is neither prog nor metal. This is a very entertaining album and features a strong cross section of musical styles. Machiavel (Mario Guccio, Thierry Plas, Marc Ysaye, Roland De Greef and Herve Borbe) are joined on one track by jazz legend Toots Thielemans and on another by Jean-Luc de Sttellla. 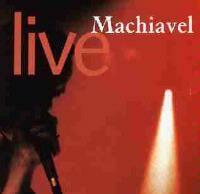 For ordering, and other info, check out the band website at http:// www.machiavelmusic.com. Keys begin this cut, in a Hawkwindish mode. A drone takes over for a time, then gives way to a classic rock sort of texture. All this is on the keyboard introduction. As the rest of the band comes in, the texture becomes more metallic. This is an accessible rock cut. It features vocals that at times call to mind White Witch. This is a strong cut with progish elements, particularly in the intricate and neo-classical instrumental section. This is a reggaeish sort of cut with a strong chorus. A pretty progish acoustic guitar and vocal intro starts the cut. The keys drums and bass kick in and the mode takes on that of a prog ballad with a vaguely circus side show atmosphere. It shifts gear again, a bit more high energy this time, with the percussion dominating. This segment is a bit Genesisish. Then there is another change to more metallic tones. The next change is in to prog, but quite hard-edged music that is similar to the stomping type section of Yes' "Roundabout". The song wanders around that style for the rest of its length. A bouncy, somewhat jazzy intro leads to a bluesy mellow rock mode. The cut then turns more metallic for a few moments before a short prog interlude. Then prog modes based on metallic sounds take over for a time. The next changes are a drastic jump to Genesis-like tones, and then a twist into darker tones. A solid hard rock cut, this is a good strong number. With a keyboard-dominated intro, this song is a somewhat mysterious sounding slow paced number that is rather powerful. It suddenly changes to faster paced, somewhat proggy metal with a catchy hook and lots of intriguing changes. After a time, it becomes more straightforward metal, really rocking out. Starting with dramatic acoustic guitar modes, this one gets pretty and jazzy when the vocals come in. This one feels a bit like a Greg Lake ballad. It is a very evocative and strong piece. Starting with piano, this one has a balladic first verse, and much of the early portion of the piece is in the form of a powerful piano and vocal ballad. Other keys come in in later segments, and the cut gets even stronger. Then other instruments join and it just keeps building on the same themes, becoming more and more powerful. When the instrumental break hits, it is in neo-classical modes that feel at times like Alice Cooper and at times like Mike Oldfield. The number keeps going faster and faster, taking on ethnic sorts of tones at times. It ends with piano. This is a killer track. Feeling a bit like Supertramp right at the beginning, this is a nice progish ballad. Thielemans' harmonica serves in the intro and outro of the piece..
A bluesy acoustic based cut with some great guitar work, this one begins to build, becoming less bluesy and more intricate. It still shows signs of the blues influence, though. The early segments are generally an acoustic rocker that really works. It features a great piano solo. The cut then goes electric, and when it does, it feels a bit White Witchish. This is a good classic rock type of composition. Hard Edged metal strains begin this one, and it begins to take on more mainstream textures. A bit Journeyish in places, this one gets progish, but is definitely a catchy hard rock/metal cut in overall nature. It does have a nice progish vocal break. This track is a piano solo. It starts off much in an Emersonian mode, but it gets Wakemanish at times and moves off in its own direction as well. Certain sections are a recurring theme that has a great melody. This one leads directly into "Fifth Season". Starting with a wonderful piano melody, this one quickly begins to build. It begins to take on traditional prog modes with a hard edge. A dramatic spoken word verse drops the cut into its main section. This is Pink Floydish prog mode that is very well done. This one gets Genesisish at times. This is an emotional rocker that starts off a bit in an Elton John sort of mode. It becomes a hard rocking metal cut after a brief, almost Rycheian, bridge. This is a very strong cut that really rocks. Slightly Maidenish, this one starts off in fast paced modes. It becomes a slower, more effects laden, instrumental jam for a long time, then jumps back in full of fury and fire. This is another that feels a bit like White Witch in the vocal department. This is a strong rocker and includes a long crowd section at the end. This is simply a nice balladic rocker. A good slow paced rock cut mode begins this one. It starts building and becoming a strong prog rock number with solid heavy leanings. Another rendition of the song Fly, this one features a long break with spoken word accompanied by percussion. It is almost a rap, and all in French.